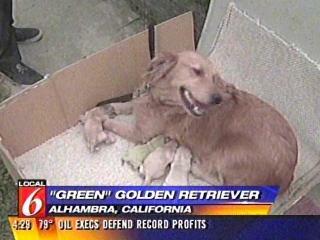 Photos of a green puppy given birth by a golden retriever in California is the current hot news. The little puppy is now named Wasabi (the spicy green mustard you put on sushi). 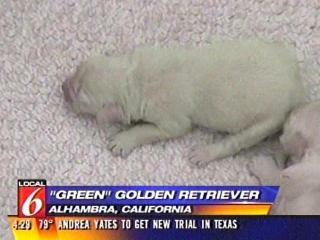 Veterinarians said that it’s possible for a newborn pup’s fur to be green because the placenta, which is green, sometimes rubs off during birth.